LUSH No Drought dry shampoo (press sample): for the past several weeks I've cut down to washing my hair only once a week to preserve the red colour. As you can imagine, it's a bit harder to keep hair looking clean when you're sweating in 30+ weather. No Drought is doing a good job of absorbing oil and giving my fine, limp hair a boost of volume. It's infused with grapefruit peel and lime oils and pretty much smells like Saje's Liquid Sunshine diffuser blend (my absolute favourite!) and a dry shampoo had a baby together. La Roche-Posay Anthelios Mineral Ultra-fluid Lotion Tinted (press sample): alcohol-free is pretty surprising considering this tinted sunscreen has a super lightweight texture. I like that it's SPF 50, which is what I usually wear for sunscreen. What surprised me the most is that the tint is really good: I might pop a bit of concealer on top if I'm feeling fancy, but it evens out my skin and gives a glow that's just enough to roll with an effortless, not-too-done-up everyday summer face. I have a full post coming up with before/after photos so you can see just how good this stuff is. 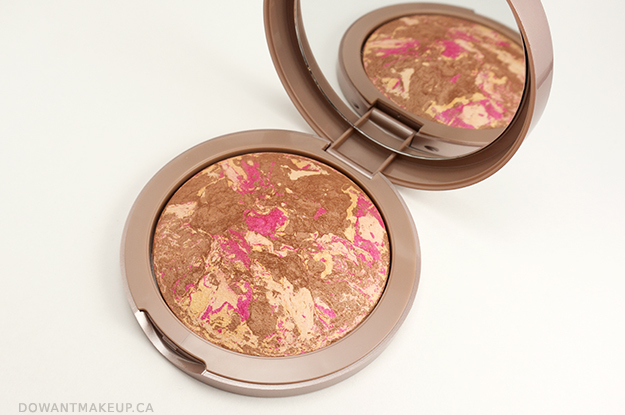 Lise Watier Rivages bronzer (press sample): aka "the bronzer that made me love bronzers again." 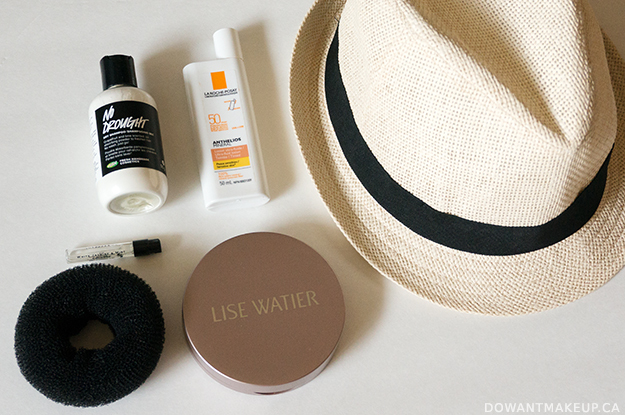 I fell out of wearing bronzer a long time ago, but something about Lise Watier's LE summer bronzer is just so lovely. Most days, I'll sweep this on top of the LRP tinted sunscreen and skip blush and contour to complete my lazy summer makeup. Goody Bun Foundation (press sample): this thing is the greatest ever. It took a little practice to get used to, but I can now roll my hair into a neat little bun without even using an elastic to tie my hair in a ponytail first. It keeps my long hair out of my face/off my back in hot weather, and this particular one is not too big, so I'm able to cover the entire mesh donut thing with my fine hair. And since I don't use an elastic with it, I can comfortably keep my hair in the bun all day and night without getting a headache. If I keep it in long enough, it gives my hair super pretty waves. Jo Malone White Jasmine and Mint eau de toilette: it's been well over a year and my obsession with WJ&M continues while I stretch out my baby sample vials. I still flip-flop over committing to buying a full-size bottle. It's stunning to wear in summer, when the green notes of mint and jasmine cut through sweltering heat. H&M men's straw hat: I picked this up last year, but they should still carry some version of this hat. The brim isn't wide enough for me to really think of it as sun protection for my face, but at least it protects my scalp (sunburn on the scalp is a bigger problem for fine-haired folks). Also it makes me look kind of put-together when I'm actually very sweaty and gross. I was realized later I should have photographed the Rivages bronzer open for maximum prettiness. Here's a proper product photo of it instead! What are you go-to summer products right now? BISC Vol. 12: Do you toss expired makeup?